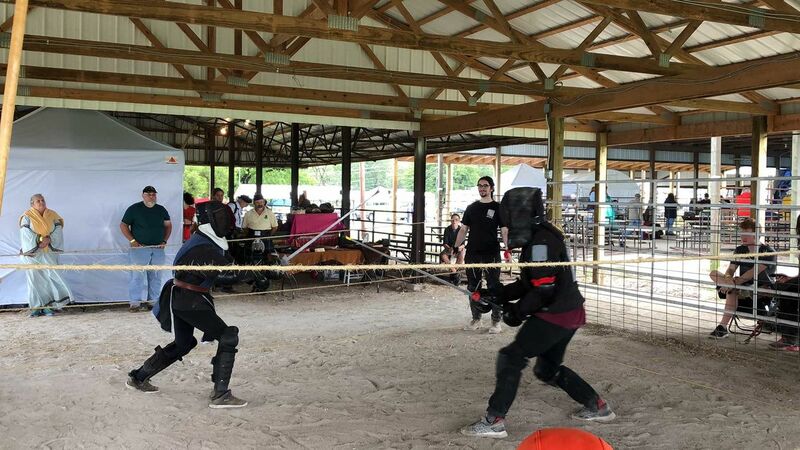 Covering a variety of sword types, and the techniques and principles specific to each type, we’re proud to offer sword fighting classes to novices, amateurs, and experts of all ages. We encourage you to enjoy your session with us; our groups are focused on fun, with true techniques and a bit of exercise thrown in for good measure. Though we are serious about the principles of historical European martial arts, we’re pretty set on making it something you’ll wanna keep doing. Move beyond fencing and show that inner kid what swordplay really looks like by taking a swords class or two—at Baer Swords, we offer lessons in a wide range of different swords and weaponry. Group rates for 10+ are available upon request. Individual/Personal training is also offered on an hourly basis. Please contact for pricing and details. Testing is an additional fee outside of class fees as is the norm with Martial Arts classes. Testing fees run $50 per testing and include the test and a complimentary t-shirt indicating the rank achieved as well as the respect of the instructor and fellow students. Find out more by calling us (816-321-2577) or stopping by our Kansas City sword fighting studio. Any instructor can help you get started or answer any questions you may have. All Purchases Are Final. No Refunds Are Given.